Basic, rugged vehicles that are suited to the needs of undeveloped Africa have been talked about for quite a while, but have so far not really caught on in any quantity. The Turtle 1 is a bit different. It's designed to use whatever available scrap is handy, and can be built in simple, outdoor workshops. Plus, I think it's pretty cool. 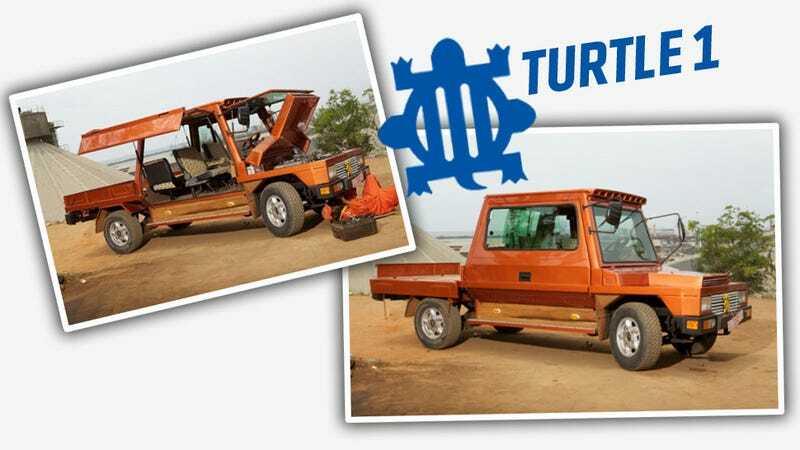 The Turtle 1 was designed in collaboration with the support of a Dutch university and the local artisans at Suame Magazine, the confusingly-named neighborhood that specializes in auto repair and modification of junked cars to use in Ghana. It's not a magazine, even though I think that every time I read the name. 5. It is built in a time frame of 12 weeks. Based on the result, I'd say they succeeded. The Turtle 1 is pretty ungainly to Western eyes, but it makes total sense in context. Most modern vehicles are getting too complex and computerized to be readily maintained in the harsh conditions of Ghana, so all of those components are removed — the Turtle 1 is an entirely mechanical car, without fragile engine computers and electronics. That may mean it's carbureted as well — I'm not sure, and it appears the engine has been salvaged from another car, and that's likely close to the plan moving forward. The chassis is much more robust than the average, say, European car, as is the simple but effective suspension. The body is designed to maximize cargo use, hence the open truck bed, and also incorporates a large cab for passengers, with a pair of large, gull-wing doors to allow maximum access to the interior. I also suspect the gull-wing design was chosen to allow for easier driving with the doors open if the situation demands it. There's no complex curves in the body, and everything can be built in the sort of outdoor workshops that are so common in Suame Magazine. A simple press and cutting tools should be enough for all panels. All the glass is simple and flat, and the light units can be taken from salvage vehicles, as can the seating, instrument cluster, controls, and many other accessories. In fact, as much as possible is designed to be taken from salvaged vehicles. Which may mean that future "production" models of the Turtle 1 will vary a good bit in looks and dimensions, with the cars just fitting to a general set of design parameters. The truck is never really intended for volume production as is normally understood, but a baseline design for these workshops to build to, with a set of well-defined standards, seems like a very workable model. The first Turtle 1 has been sent to Holland for evaluation, and based on those results, more detailed plans for further production will be developed. Personally, I find this end of the automotive spectrum more exciting than the expensive supercar side — anyone with enough money to throw around can build something like a Veyron, but making something that can really change lives and function in such demanding enviroments is genuinely exciting. You can support the project here, and you can also daydream, like me, about getting one here in the States to use as a work pickup, because I think these things are really cool.